When Is Wrought Iron Not Wrought Iron? I grew up with a blacksmith for a parent, and thus almost every metalworking processes seems entirely normal to have as part of everyday life throughout my childhood. There seemed to be nothing we owned that couldn’t be either made or repaired with the application of a bit of welded steel. Children of blacksmiths grow up with a set of innate heavy hardware hacker or maker skills that few other young people acquire at that age. You know almost from birth that you should always look away from the arc when dad is welding, and you also probably have a couple of dictionary definitions ready to roll off the tongue. The first is easy enough, farrier. A farrier makes and fits horseshoes. Some blacksmiths are farriers, many aren’t. Sorry, my dad made architectural ironwork for upmarket houses in London when he wasn’t making improvised toys for me and my sisters, he didn’t shoe horses. Next question. The second is a bit surprising. Wrought iron. My dad didn’t make wrought iron. But… Hang on, you say, don’t blacksmiths make wrought iron? At which point the floodgates open if you are talking to a blacksmith, and you receive the Wrought Iron Lecture. Ah, the days when men were men and people died of asbestos related illnesses in their 30s. Let this video take you back to the ancient times when chains were forged by hand, destructively tested using wooden capstans, and sent off to furnish the ships of the line, way back in the year 1940. 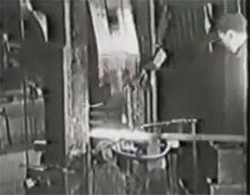 The video is something of an advertisement for the Netherton iron works, located in the English midlands. Founded sometime in the mid 19th century, it appears the tooling and machinery didn’t change much the hundred years before this was filmed. The chain begins as a gigantic mass of wrought iron bars brought in from a forge. These bars are stockpiled, then sent through chain shears that cut them into manageable lengths a foot or so long. The next scene would probably look the same in 1940 as 1840, with gangs of men taking one of the bars, heating it in a forge, beating it on an anvil, and threading it through the last link in the chain they worked on. This isn’t the satisfying machinations of industrial automata you’d see on How It’s Made. No, this is hard manual labor. Whether through simple quality control or an edict from the crown, the completed chains are tested, or more specifically, proofed. Yard long samples are tested to their failure point, and entire chains are proofed to their carrying capacity in 15 fathom ( 90 feet) long lengths. These chains are then examined link by link, stamped and certified, and sent off to mines, factories, tramp steamers, and battleships. Although the Netherton iron works no longer exists, it did boast a few claims to fame in its day. It manufactured the anchors and chain for both the Titanic and Lusitania. Of course, such a large-scale production of wrought chain in such an archaic method would be impossible today; today, every wrought iron foundry has been shuttered for decades. If you’ve ever wondered how such massive things were made with a minimal amount of machinery, though, there you go.